Some of you may remember back in November, 2005, when I posted snippets from an FDA public hearing on DTC (see "FDA DTC Hearings: Snippets from Day 1"). Well, yesterday's U.S. House of Representatives Energy and Commerce hearing on DTC seems to be a replay of the FDA version. You might say that Congress is re-enacting this investigation into DTC precisely because two and one half years after FDA held it's hearing, the agency and the drug industry have done precisely ZIP about the issues raised. In fact, since 2005, the industry and FDA have cozied up and are attempting to rubber-stamp FDA's approval of DTC ads under a payola scheme (see "PDUFA Payola!"). But enough about trivial matters. Let's focus on the testimony, and especially the testimony of Ruth Day, head of Duke University's Medical Cognition Laboratory. I call Dr. Day the "Bee Lady" because she famously claimed at the 2005 FDA hearing that the bee in the Nasonex TV commercial beat its wings furiously when risk information was being presented but was still when benefit information was presented. Day claimed that the beating wings divert viewers’ attention from the risk information (see "DTC Pros and Cons Presented at FDA Hearing" for a more detailed analysis). 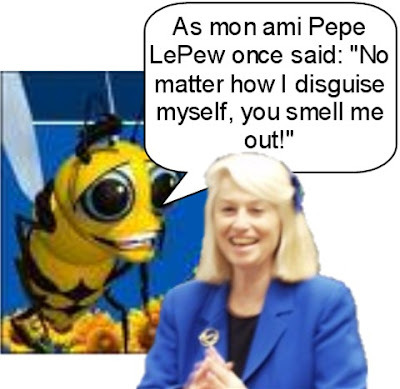 It appears that Day is sticking to her story: she retold her study results to the House Committee yesterday and claimed that the Nasonex bee flew around as side effects were listed, but simply hovered when benefits were discussed. Undoubtedly, a lot of care and attention go into the visual of a drug ad, like the blueness and clarity of the Claritin sky. In fact, recent Claritin OTC TV commercials play that visual cue to the hilt by first showing a subdued color scene that is cleared to crystal blue after the actor takes Claritin. Clearly, if Claritin were still an Rx drug, the FDA may have said this goes too far in making a benefit statement. But how devious and clever DTC advertisers must be to employ such nefarious devices as variations in bee flight to subvert the fair balance guidelines of the FDA! Not many experts actually give marketers that much credit for manipulating the elements of ads. Could it be that the drug industry advertisers hire "cognitive science" experts like Dr. Day to design their ads? Could be. Perhaps one day, Day will also move on over to the "dark side." Hey, it could happen! P.P.S. 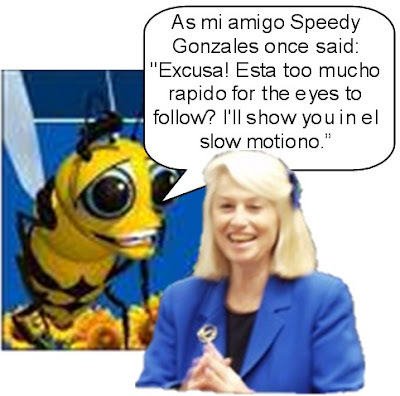 For those of you who claim the Nasonex bee is Spanish (see comments), here's the Spanish version of my cartoon on the left. Ooops John -- that bee's got a Spanish accent -- and supposedly it's the actor Antonio Banderas. Better get your stuff straight before you get attacked by Spanish-speaking and/or French readers! Sounds French to me! O well, maybe I can find a "Speedy Gonzales" quote that would do just as well! I think he's Spanish, and he's a pest. This ad has been showing for years, it seems. I couldn't figure out why the company didn't change it, because the bee is very unappealing -- now his job function has been revealed! What manipulation. The insect should be swatted out of the picture. the bee is argentinian Antonia Banderas. And they didn't get rid of the bee because it's still the most recalled pharma ad personality EVER. Edward Bernays (Sigmund Freud's nephew) is called The Father of Public Relations, and the creator of marketing. Many think he is the most influential person of the 20th century. Bernays argued that manipulation of the public was necessary for democracy. He actually "wrote the book" on Propaganda, and Public Relations...encouraging companies to use psychological sciences to their advantage.